The Bottom Line: An outstanding, relentlessly paced whodunnit with sky-high stakes and a jaw-dropping twist. One of the year’s best thrillers. When a trio of high-level political assassinations leave investigators puzzled, Superior Court Judge Cyrus Brooks and Homicide Detective Frank Lotello team up to uncover a diabolical scheme. After the murders and post-mortem sexual assaults of a senator and treasury official, the D.C. police chief begins to piece together a profile of the perp: a possible serial killer and sexual deviant, preying on female members of the political community. But something doesn’t sit right with Lotello. The killer reported the first murder to the police, and apparently also placed a call to a journalist. Why? And why wouldn’t murdered Senator Wells’ staff make her calendar available for the investigation? By the time the third victim is found — the male head of the Securities and Exchange Commission — Lotello realizes something is very wrong. The second book in Ronald S. Barak’s Brooks/Lotello thriller series, technically a prequel, is the perfect entry point for new readers. In The Puppet Master, we are fully immersed in Brooks’ insights, anxieties and ethics as he realizes the impossible task of maintaining complete impartiality. When Lotello approaches him to share his concerns about the investigation, both men are acutely aware that their careers are on the line if anyone were to find out. Privately, both men are understandably rattled by the times in which we live, an era in which mass political resentment and political violence are fast becoming the norm. Throughout, Barak offers snatches of the killers’ point of view. Clever readers may figure out the motive before Lotello can, but the intricacies of the plot will leave most in awe. 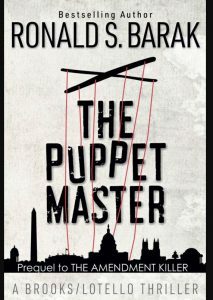 The Puppet Master has the makings of a big tent bestseller, but legal thriller fans will also delight in the book’s heady courtroom drama.